I love these! 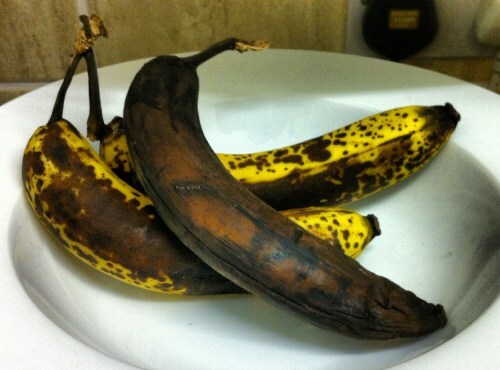 And I have some very over ripe bananas sitting looking at me accusingly. No one is going to eat them now, but they will eat banana muffins, so, a job for later. This makes a large batch so that you can freeze some for lunchboxes, etc. If you don’t want to do that, halve the ingredients. Preheat the oven to 180 degrees centigrade (gas mark 4). Combine the flour, sugar, baking powder, soda, salt and cinnamon in a large mixing bowl. Then start to slowly whisk in the milk, oil and egg until well combined. Finally, fold in the mashed banana and combine well. Spoon the mix into your cake cases and bake for around 15 minutes, until golden and springy to the touch. These are lovely warm, but equally nice cold. However, you can reheat them for about 15 seconds in the microwave.